Bound up in such concepts as sacredness, intimacy, danger and the forbidden, secrecy is something familiar to all of us. Commonly we perceive secrets as guilty, conspiratorial, or pathological, forgetting that secrets can also protect our identity, intentions, actions, and property. As individuals, to have no capacity for secrecy is to be out of control, leaving one vulnerable and open to coercion. To have no insight into what others conceal is to lack power as well. At the collective level, many have argued that official secrecy is incompatible with democracy. While others allow that institutional secrecy is sometimes legitimate and necessary, they maintain that those who exercise power must justify their control over secrecy and openness. Even with persuasive reasons, they insist that accountability is indispensable in a democracy. Still others claim that confidentiality and national security are sufficient rationale for professional, corporate, administrative and military secrecy. 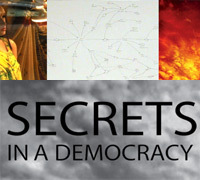 Through an art exhibition and a lecture and film series, the program on Secrets in a Democracy will examine: when secrecy is legitimate and when it is injurious; the ways in which we keep, reveal, and discover secrets and what they say about us; as well as what ought to happen when formal secrets are revealed. Do U.S. Constitutional Rights Extend to Non Citizens? "Liberty and Justice for All (except you): Art, Community Activism, and Immigrant Politics"
"Shouting Fire: Stories from the Edge of Free Speech"
"The Reckoning: The Battle for the International Criminal Court"